Cybersecurity Deal. IPC and Continent8 Technologies team up to provide world-class cybersecurity to Philippine enterprises amid the growing and evolving cyber threats today. From L-R: IPC Director for Marketing and Digital Innovation Niño Valmonte, IPC Chief Operating Officer David de Leon, Continent8 Co-Founder and Chief Executive Officer Michael Tobin, Continent8 Chief Development Officer Nick Nally. Companies worldwide are suffering from massive revenue loss due to cyber attacks. According to research firm Juniper Research, the global cost of cybercrime will reach up to $2.1 trillion in 2019 amid rapid digitization in consumer and enterprise transactions. In its bid to further strengthen its suite of web security solutions, IPC (IP Converge Data Services, Inc.), the country’s pioneer DDoS Mitigation service provider, is partnering with Continent 8 Technologies, a global ICT firm with offices in Europe and North America. 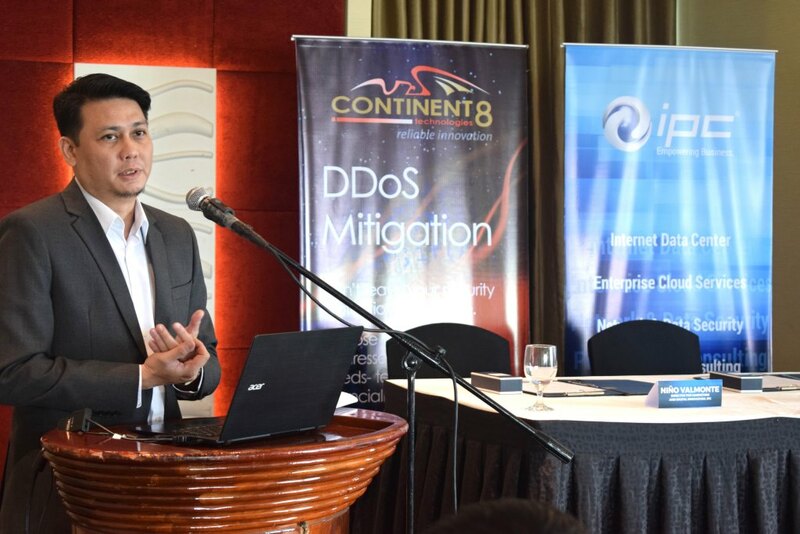 “With Continent 8’s industry-leading services spanning the globe, and IPC’s local market coverage and expertise in cloud, data center, and DDoS mitigation services, this partnership will offer Philippine enterprises highly sophisticated yet easy to deploy security solutions with truly localized support,” said IPC Chief Operating Officer David R. de Leon. DDoS is a type of cyber attack that “denies” service or renders a company’s website and servers inaccessible to users by flooding it with large volumes of malicious traffic. Hackers have launched DDoS attacks for various reasons, such as extortion, revenge, competition, diversion, and politics. Popular targets include government agencies, banks and financial institutions, online gaming sites, and software-as-a-service providers. IPC has been in the forefront of DDoS Mitigation in the country, offering protection since 2007. The company works with the world’s leading DDoS Mitigation service providers to cover all types of DDoS attacks, and manner of clean traffic delivery. In addition, IPC manages the country’s first and only locally hosted DDoS attack scrubbing center, operated by experienced and highly skilled network security professionals, 24x7. Continent 8 Technologies provides highly reliable co-location, security, managed services, and network solutions with its global network that spans across Europe, North America, and Asia. It deploys four global scrubbing centers – Hong Kong, Los Angeles, New York and London – alongside a truly global network of over 25 points of presence and multiple terabits of bandwidth. This global network is backed by an MPLS (Multi-Protocol Label Switching) infrastructure where clients can connect sites and services with different bandwidth requirements in order to create a scalable, secure, and reliable IP Virtual Private Network. By applying MPLS in DDoS Mitigation, clean traffic passes through direct lines instead of encapsulated connections, thereby ensuring a faster and more seamless protection. “With nearly 20 years of experience and operations, we have built a global reputation for service excellence alongside a unique global footprint of data centers and points of presence. By partnering with IPC, we bring to the table advanced DDoS Mitigation services to Philippine enterprises especially now that cybercriminals are becoming bolder in their attacks,” said Michael Tobin, Continent 8 Technologies Co-founder and Chief Executive Officer. A local cloud services pioneer in the country, IPC owns and operates three state-of-the-art data centers, located in Makati, Parañaque, and at Bonifacio Global City, Taguig, which are all part of the ePLDT VITRO network of data centers. Out of these facilities, IPC also provides dedicated Internet access to its customers through its own robust network infrastructure. Bolstered by Continent 8’s wide global network, IPC can also cater to local companies looking to extend their networks to Europe, Asia, and the rest of the world. "With the intensifying threats enterprises face today, there is a pressing need to put in place more steadfast and technologically diverse defense mechanisms. IPC urges companies to take an aggressive stance by employing the latest cybersecurity technologies. On our part, we are continuously enhancing our security portfolio to cater to the evolving requirements of the enterprise," said de Leon. To know more about protecting your company against DDoS attacks, go to http://ipc.ph/en/ddos/.